City Utilities residential sewer customers are eligible for a rebate of 50% up to $3,500.00 after the replacement, purchase, installation, and inspection of a failing sewer lateral between the home and the city connection. Certain restrictions apply; see Guidelines. In the City of Gulfport, the pipeline or “lateral” that connects the building plumbing to the public sewer system is owned by the private property owner. The private property owner is also responsible for maintenance of the private lateral, which typically extends from the building’s plumbing to the property line. The City sponsored program will assist private homeowners in replacing their home’s defective Sanitary Sewer Lateral(s) that connect to the City’s Sanitary Sewer System. The goal of the program is to reduce the amount of private property ground and surface water inflow and infiltration (I&I), subsequently entering the City’s Sanitary Sewer System for conveyance for treatment from defective privately owned Sanitary Sewer Lateral(s). Removing the inflow and infiltration (I&I) will assist in providing recurring capacity within the City’s system. This reduction will assist in reducing system discharges from the City’s Sanitary Sewer System. The magnitude of inflow and infiltration associate with private laterals can vary greatly depending upon the age and the level of maintenance provided by the private owner as well as the materials and methods used to construct the lateral. Illicit connections of roof drains, yard drainage, underdrain systems, and sump pumps. It is difficult to measure the amount of inflow and infiltration from private laterals because installing flow meters at all connection points would be cost prohibitive. Much of the data available is based on estimated flows. The majority of respondents to a survey of utilities by the Water Environment Federation conducted in 2015 indicate that private inflow and infiltration sources can contribute anywhere from 20% to 75% of wet weather flow. The estimate utilized by the City of St. Petersburg is 38%, with the City of Largo estimating 50%. A presenter at the Pinellas County Legislative Delegation meeting estimated 70% for the area. In addition to causing excessive flows to the public sewer system and subsequently to the wastewater treatment plant, inflow and infiltration in private laterals can also cause sewer backups into buildings resulting in property damage, health risks and environmental issues. High cost to repair private laterals ($2,000- $5,000 per property). Restrictions in place on spending public monies on private property. (Article VII, Section 10, Florida Constitution). The Florida Constitution addresses the expenditure of public monies to benefit private entities or persons. The expenditure of public funds must be for a primarily public purpose, with only incidental or secondary benefit to private interests. “However, failing sewer laterals contribute excess sewage to the public sanitary sewer systems and potentially cause or contribute to the failure or overloading of the City’s (public) system. The inflow and infiltration from laterals can cause sewer backups into a community’s buildings resulting in damage to surrounding properties, community health risks and environmental degradation”. The property must be within the City of Gulfport. Only property owners of single family residential owner occupied homes connected to the city’s sanitary sewer system qualify. The sewer lateral replacement must be permitted through the Community Development Department. The lateral replacement must be at the address listed on the permit. The program only applies to those laterals which are replaced in their entirety from the residential structure to the property line; spot repairs and partial repairs are not included in this program. Verification of installation and an inspection and approval of completed work by the city is required. 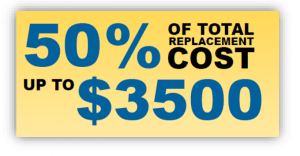 The reimbursement will be 50% of the lateral replacement cost up to $3,500.00. The allocated $127,500.00 is available on a first come, first serve basis until the funds are expended. The property owner must submit a lateral replacement rebate application within 45 day of verification of installation and an inspection and approval of completed work by the city. The property owner must submit, with the rebate application, a dated, detailed sales receipt for proof of purchase. The purchase price of the sewer lateral must be clearly itemized on an invoice. Reimbursement for the sewer lateral replacement may take four (4) to six (6) weeks from the date the rebate application is filed. Reimbursement funds will only be released to the property owner. The rebate program is only in effect when funds are allocated for that purpose within a given budget year. Contact Public Works, 727-893-1099 for the Rebate Application.